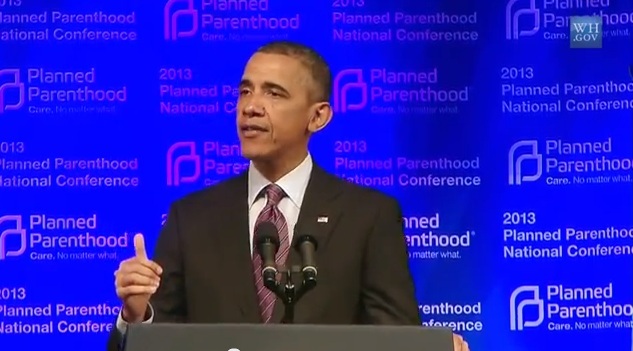 Where is Obama on late-term abortion? Today we have a big problem with the word "life" that, according to our founding Declaration, we all have a right to. The House passed an historic piece of legislation last week that prohibits late-term abortions. The "Pain-Capable Unborn Child Protection Act," introduced by Rep. Trent Franks, R-Ariz., with 187 co-sponsors, passed in the House by a vote of 228-196. The measure prohibits abortion 20 weeks -- five months -- or more after conception. As Rep. Marsha Blackburn, R-Tenn., who led the debate on the bill, noted in her remarks, science is clear that at this stage, at the end of the second trimester of pregnancy, the unborn child feels pain. This initiative was a response in the House to the tragedy and outrage of the case of Kermit Gosnell, the Philadelphia abortion doctor recently convicted of murder of three children in late term abortions. Yet despite the clarity that a child in the womb after five months is living, moving, and feeling, our president, who likes to present himself as a man of compassion, not only wasted no time in indicating he will veto this bill, but he doesn't even want to have the conversation. Immediately after it passed the House, the Executive Office of the President issued a statement saying that this bill was "an assault on a woman's right to choose" and that if presented with this bill, the president's "senior advisers would recommend that he veto" it. Does a woman's "right to choose" really include murder? Shouldn't the American people at least hear an explanation from their president why he would conclude that a child -- moving and feeling in the mother's womb -- is not life? And if it is life, why is it not murder to kill this child? And if it is murder, why should it be legal in a nation that claims to be civil, moral, and free? You might think that differences in ideas and values are what divide our country. But perhaps it is not values or ideas that divide us but words. Who would challenge the words in America's Declaration of Independence, written almost two and a half centuries ago, that "all Men are created equal" with rights to "life, liberty, and the pursuit of happiness"? Today a black man sits in the White House and serves as president of this country. But at the time of the nation's founding, black skin was enough to disallow a man from being legally considered a man, deserving of those inalienable rights enumerated in the Declaration of Independence. Americans look back in disbelief that this was once so. That someone who looked just like our current president could not only not have ever dreamed about leading the nation, but couldn't even dream about being treated like a human being. We're still having a hard time with words. And, perhaps with no small amount of irony, the black man in the White House, who once might not have been considered a "man", cannot seem to accept that a child -- growing, moving and feeling in the womb of its mother -- is "life." Or even worse, that our president doesn't want to even discuss this very difficult and painful issue. It's pretty clear to most of the American people that there is a real problem with legal late-term abortions. In 2011 polling done by Gallup, 79 percent those who are "pro-choice" and 94 percent who are "pro-life" said third trimester abortion should be illegal. Fifty two percent of those "pro-choice" and 90 percent of those "pro-life" said second trimester abortions should be illegal. When the majority of the American people see the grave moral problem of late term abortion, shouldn't they hear from their President why he thinks this moral outrage should be legal in America? Or why he doesn't want to recognize and respond to the legitimate moral concerns of our citizens?